© USS Gambier Bay & VC-10 Assoc. NOTE: View the Original Artwork of "Freedom's Cost" on permanent display in the Franklin D. Roosevelt Presidential Library in Hyde Park, New York. 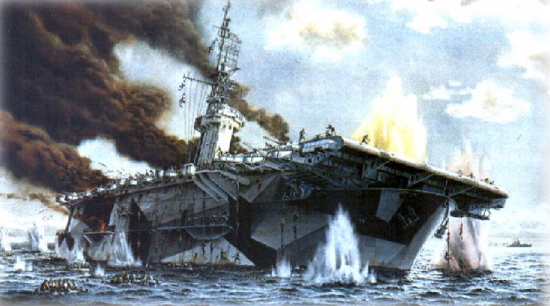 "Silhouetted against the dawn as the Central Japanese Force steamed through San Bernardino Strait towards Leyte Gulf, Task Force Unit 77.4.3 was suddenly taken under attack by hostile cruisers on its port hand, destroyers on the starboard and battleships from the rear. Quickly laying down a heavy smoke screen, the gallant ships of the Task Unit waged battle fiercely against the superior speed and fire power of the advancing enemy, swiftly launching and rearming aircraft and violently zigzagging in protection of vessels stricken by hostile armor piercing shells, and antipersonnel projectiles and suicide bombers." "The history of the United States Navy records no more glorious two hours of resolution, sacrifice, and success." Mr. Richard Moore was a line officer on the destroyers in the Atlantic after his graduation from the University of Pennslyvania. Following this service, he attended theological seminary and returned to the navy as a Chaplain on destroyers in the Pacific. After years of service as a Pastor, Mr. Moore retired to Hampton, Virginia, where he pursues a career as a marine artist. In the early 1990's, Mr. Moore was commissioned by the Gambier Bay and VC-10 Association to do a painting of the Nuclear Carrier George Washington. In official ceremony on July 4,1992, some of the surviving members of the USS Gambier Bay (CVE-73)passed their hull number 73 to the commanding officer of the USS George Washington (CVN-73). The painting of the George Washington and a print of "Freedom's Cost" hang in the Officer's Lounge aboard the George Washington. Mr. Moore's paintings of Navy and Historic ships of every period are in many private and corporate collections in the United States and abroad. At the time of these paintings, Mr. Moore served as President of the Prestigious American Society of Marine Artists. "Working with the survivors of the Gambier Bay was a great pleasure and privilege. First hand accounts from members of the crew on that momentous day were essential to the accuracy of the painting. However, when I first submitted a pencil sketch for approval, I was told in no uncertain terms, "If the Japanese cruiser had been as close as you drew it, then we would have all died of fright!" Needless to say, the cruiser was subsequently painted at a greater distance. My best wishes to all of the survivors of the Gambier Bay, who are indeed my personal heroes!" This book is unique for never before has virtually a whole crew of a ship shared experiences with an author, as the men of the Gambier Bay have done with Edwin P. Hoyt. The result is a multifaceted story of events and men at all levels from the captain down to the ordinary seaman gambling in the potato locker. From Pearl Harbor on December 7th to the towns and villages of America on that fateful day, the author traces the lives of those who would join the Gambier Bay, and brings them to their ship, and to VC-10, the Composite Squadron of naval aircraft that would fly from her 480- foot deck.